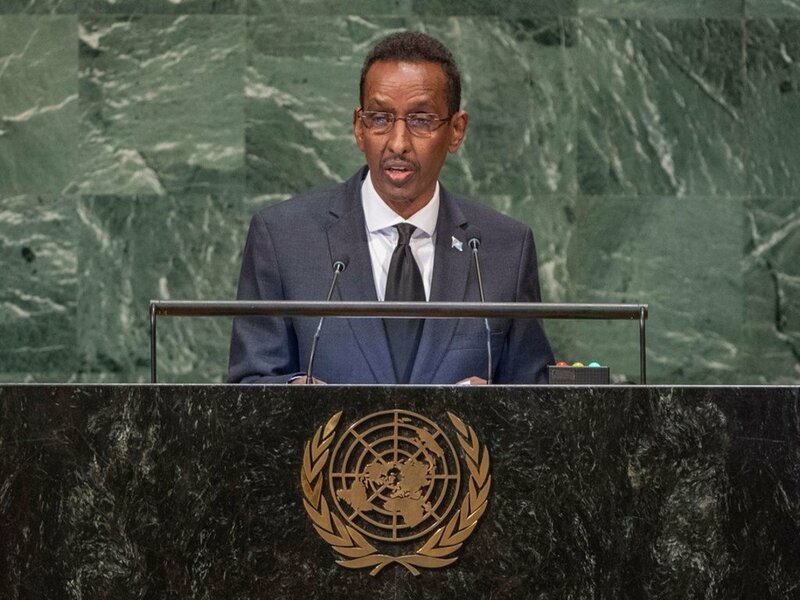 Foreign Minister Ahmed Awad Isse of the Federal Republic of Somalia addresses the seventy-third session of the United Nations General Assembly. Solving that problem once and for all requires a multi-faceted approach, said Ahmed Awad Isse, the Minister for Foreign Affairs of Somalia. Working with its partners, the nation has dismantled terrorist networks and hideouts. It is also engaged with religious leaders, community elders, women, youth and the civil society to “turn the tide against the twisted ideology of hate and religious intolerance,” said the Minister, addressing the UN Assembly’s annual debate. “The silver lining is, young men and women are not joining terrorist groups,” he added. He went on to note that the ideologies presented by Al-Shabaab or Al-Qaida are no longer appealing, and the groups no longer have new recruits. In addition, leaders and members are surrendering along with so-named ‘technicals’ (improvised attack vehicles) and weapon caches. In that context, the Minister called on the UN Security Council to lift the arms embargo on his country, stressing that stronger fighting capacity will help national security forces fully dismantle terrorist groups in a shorter time. Alongside that, gains in security, as well as the Mission’s support to Somali security institutions will enable the country to gradually take over responsibilities from AMISOM, he said. The Somali Minister highlighted that the country’s reformed, inclusive electoral model has been approved at both central and provincial levels. He also informed the General Assembly of the country’s economic development goals, building upon its productive capacity, natural potential and international trade. “We are seeking to strengthen alliances with our core partners to promote trade and investment opportunities even as we widen our scope in our quest for broader, far-reaching economic cooperation,” said Minister Isse. “We are ready for business,” he said.